Welcome to PONDMASTER SERVICE your officially authorized National Sales and Service Center for OUT of Warranty Repair or Replacement for EG Danner Manufacuring. 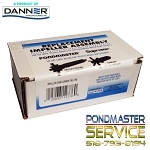 PONDMASTER SERVICE is an organization partnered with EG Danner Mfg. with the sole purpose of providing both Dealers and Consumers across the U.S. and North America the best possible solutions for either REPAIR or Replacement of Their EG Danner family of products. IE: Pondmaster, Pro-line, Supreme, Hampton, Cleargaurd, Supreme-Hydroponics, ShinMaywa and Fountain Pumps. Here we can assist you with your OUT OF WARRANTY product repair-ability diagnosis and or replacement options. Put our 30 plus years of experience to work for you and help you SAVE money by repairing your PONDMASTER Product if possible, and or going over your replacement options at low pricing. Dealer Pricing is also available here. (Proof Of Dealership is Required). If you have questions, comments or concerns about your order or the content found within this website, please feel free to contact us via telephone or email and one of our experienced team members will get back to you right away. Again, thanks for visiting PONDMASTER SERVICE and we look forward to serving you in the future.